Russia's first large airliner since the fall of the Soviet Union made its maiden flight Sunday. The Irkut MC-21 is designed to compete with the most popular airliners in the world, the single-aisle Boeing (BA) 737 and Airbus (EADSF) A320. The prototype took flight Sunday morning from the Irkutsk Aviation Plant airfield in Siberia, about 2,600 miles east of Moscow. During the 30-minute flight, the plane reached an altitude of 1,000 meters (roughly 3,300 feet). Oleg Kononenko, the flight's lead test pilot, reported that the aircraft operated normally. 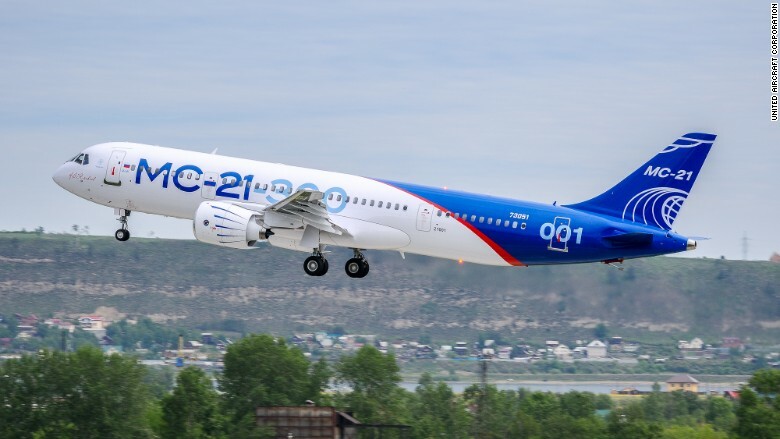 The MC-21's maiden flight was notably shorter than that of its Chinese competitor and other similar aircraft, which have typically flown for an hour or longer and at a higher altitude. The flight comes ahead of the Paris Air Show, which starts June 18. Irkut hasn't yet said whether the jet will be ready in time to make its international debut at the event. The Russian aircraft's debut is the latest in a series of aviation firsts in 2017. The unusually busy year has featured a parade of maiden flights by new models from airplane makers around the world. China's new challenge to Boeing and Airbus, the Comac C919, made its first flight on May 5. But while Russia is pushing the MC-21 with airlines around the world as a way to increase its non-military aerospace exports, Comac has shown less interest in selling the C919 overseas. Russia's commercial aerospace industry has struggled over the past quarter century to regain the strength it had during the Soviet era. Through projects backed by President Vladimir Putin, it has sought to shed its reputation for advanced, but unreliable, passenger aircraft. The country last week formalized a partnership with China to made a long-range twin-aisle airliner to compete with Boeing and Airbus. The MC-21 is expected to start flying passengers in 2019 after it completes testing. Russian airline Aeroflot will be the first to fly the new jetliner. 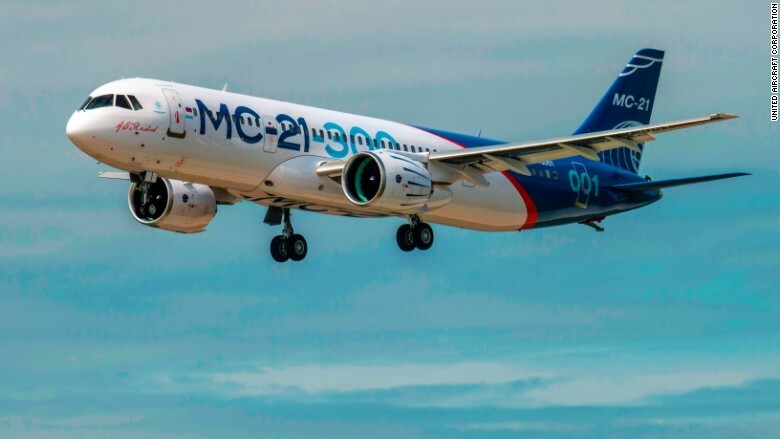 The state-run carrier has relied heavily on Airbus and Boeing jets as part of its modernization, but Russian policy has encouraged the introduction of homegrown models, like the MC-21. The Irkut MC-21 on its May 28, 2017 maiden flight. Irkut says the MC-21, which seats 163 passengers in two classes, will be 12% to 15% less expensive to operate than its Western counterparts. The manufacturer has taken 175 orders for the jet, which has a range of about 3,500 nautical miles or 6,400 kilometers. Irkut is an arm of the Russian state-owned aerospace conglomerate United Aircraft Corporation, which supplies the country's airborne military hardware. Like the Chinese C919, the MC-21 has used many Western aerospace suppliers. The jet took the sky on Sunday powered by two U.S.-made Pratt & Whitney geared turbofan engines, which are also used by Airbus, Canada's Bombardier and Brazil's Embraer. Russia is developing a new engine of its own for the MC-21. While the Russian aerospace industry has lagged U.S. and European companies, Airbus and Boeing are closely watching the new jet's progress. The MC-21 is packed with advanced carbon fiber technology and flight controls that haven't yet made their way to Boeing and Airbus aircraft.